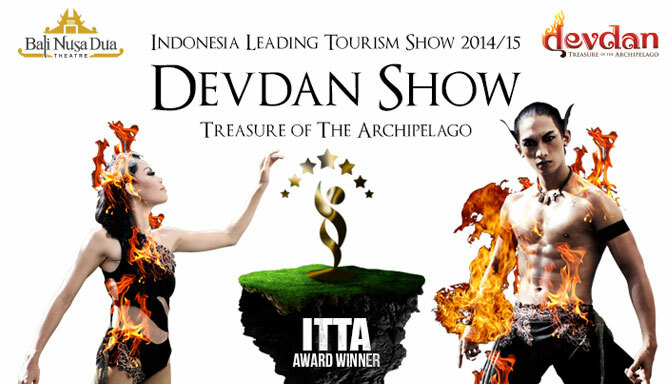 Bali Nusa Dua Theatre has been granted as the Best Tourism Show 2014/2015 for its breathtaking Devdan Show. The winners of this ITTA are chosen in 55 categories from more than 200 nominees. ITTA awards are annually given for hospitality industry such as hotels, resorts, and other properties related to tourism industry. Mrs. Handari Himawan, the General Manager of Bali Nusa Dua Theatre asserted that this award will not be achieved without the team. "This award is dedicated for the whole team of Devdan Show who has worked hard to maintain the quality of the show,"
Devdan Show is a 90-minute show depicting the culture from 5 big islands in Indonesia, as the treasure of this archipelago. The performance is scheduled 4 times in a week on the stage of Bali Nusa Dua Theatre.